Handmade in Nepal, 4 unique strands of felt owls hang approximately 20 inches from a felt star. 100% all-natural wool. At Yoga Geek we feel that the principles of Fair Trade mirror the finest principles embodied in Yoga and Meditation traditions of the past and present. Fair Trade is a global movement that began in the 40’s and exists now as various parallel initiatives throughout the world. 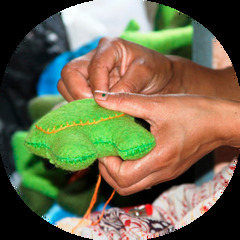 Driven by the efforts of Non-Governmental Organizations (NGOs) and socially motivated individuals, Fair Trade began by providing advice, assistance and support to disadvantaged producers. Fair Trade has come to be a trading partnership, based on dialogue, transparency and respect, that seeks greater equity in international trade. It contributes to sustainable development by offering better trading conditions to, and securing the rights of, marginalized producers and workers.